Updated with Janet’s comments below. Did you know in Australia it’s possible to ruin a business if you don’t like the way it smells? This is a heartbreaking story — that a government could effectively ruin a family by slowly strangling them in red tape, and that they would have apparently no protection from the courts or the ombudsman. It eats away at our sense of justice. Can we speak freely? Are we all treated equally under the law, or are some laws only enforced according to a capricious whim? This is the price we pay for vague laws where business people can run ventures, do everything to the letter of the law, with best-practice procedures, winning customers and contracts, yet go broke despite all that because of onerous, impossible-to-meet conditions, that are unmeasurable, and change suddenly, with the added bonus of inordinately long delays. At the moment, Janet and Matts farm, Narrogin Beef Producers, lies empty, unstocked, while debts accrue by the minute. This is also a story of sovereign risk. Investors in Australian industry beware. Unused equipment that cost hundred of thousands of dollars lies idle. How can any business survive the need to get two-yearly licenses which take more than 12 months to arrange; where after four years of planning and preparation, capacity can be suddenly halved without warning; where an appeals process can take 18 months and when the original capacity is finally restored, not only are many new stipulations added, but the expiry date is not extended. After 30 months of a grinding process, the farmer is only left with 6 months before the amended license expires and no way to take out loans based on such an uncertain future. If the government were a private business paid to arrange licenses, and expected to be evidence based and to respond in a reasonable time, then they would have no customers. Indeed, they could be sued. Matt and Janet were told their license would be a formality, and they took out loans and contracts for water and grain in advance. Their input costs last year added up to around $10 million dollars. When the capacity was halved there was no way under the laws of biology and commerce that they could bring in the cash flow to meet those costs. When they appealed, they was no timeframe, no indication it would take 18 months to be resolved, so they took out loans, bore the costs, the interest, and paid for water they did not use, and grain no cow would eat. Their money was effectively squandered by the unpredictable rulings of the state government. Bear in mind, the Thompsons have broken no laws. Most of this case boils down to a small number of complaints about odour. I would not wish foul smells on anyone, but the evidence there is suggests the problem is minor, and the level of complaints has no relation to the number of stock on the Thompson’s farm in any case. There is the troubling possibility that if someone took a dislike to another party, or had another vested interest in property nearby, or in a competing business, theoretically they could solicit complaints and exaggerate. How would we know? It’s hard to photograph a smell. It’s an avenue ripe for exploitation. Lets keep things in perspective, Janet and Matt live at their farm, closer than anyone else to any odours and emissions, and their farm is next to a piggery (ferrgoodnesssake) which has been there for more than 20 years. From 5 km away in the town could anyone tell if a waft of something not-nice was from a cow, or a pig, or the roadkill around the corner? By last October, the Thompsons were despairing, and tried to auction the business , but who would buy an operation that had no future without an adequate license? They employed 24 full time staff at their peak, and have had to reluctantly ask most to leave on Nov 13, 2009. He had put his whole heart and soul into building and developing our feedlot, and had done an absolutely astounding job. Lindley was a doer…a problem solver… one of those guys that could turn his hand to anything — with a smile. He also proved himself to be an amazing people manager and he knew more about our place than we did. Depression is an elusive animal, and we can never know everything that was going on inside of him, we know that Lindley felt frustrated that he could not solve this problem. Lindley committed suicide on March 25 this year. Matt and Janet were distraught. The Thompsons have appealed to the Ombudsman, and tried the High Court. They’ve sought extensive, expensive legal advice, they’ve paid thousands to have odor tests done. It’s also a story that desperately needs investigation. 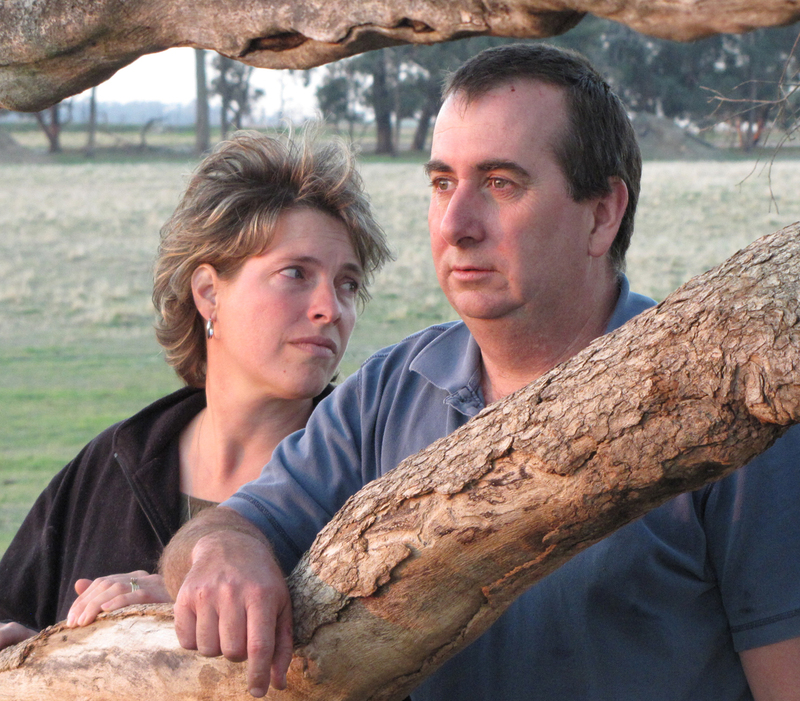 Janet and Matt Thompson brought their life savings to Australia to set a business they had an expertise in. In 2002 they applied for permission to run a cattle feedlot (they refer to it as a B&B for cows) for up to almost 15,000 cattle. The locals in Narrogin mostly thought it sounded like a good idea and the feedlot was placed next to a piggery about 5km south of the town. They had to wait a whole year for the red tape and the Works Approval to allow them to start, then put in all their life savings to building up the farm. But in May 2007 Matt spoke at the WA Lot Feeders Association about the National Environmental Protection Measures (NEPM) — which included greenhouse gases. Matt expressed doubts that greenhouse gases should be included (and handed out copies of the Great Global Warming Swindle DVD as background information, which no doubt was not at all fashionable at the time). Naturally, it impossible to say whether this had any bearing, but soon after the meeting the Department of Environment and Conservation (DEC) began to pay a lot of attention to the Narrogin Beef Producer’s application — and correspondence increased dramatically. One of the most unsettling aspects of the Thompson’s tale is the involvement of the Environmental Defenders Office (EDO). An NGO, but funded by the government, the EDO advised and taught a small group of complainants how to file writs and appeals and target businesses or practices. In early 2008, we hired attorneys in Perth, as it had become apparent that a positive outcome was not going to be forthcoming with DEC. After getting up to speed on our case, the solicitor and barrister suggested that we meet with Dr Johannes Schoombee, an environmental attorney skilled in these matters. His web page referred to his expertise in property rights among other things so we agreed. Dr Schoombee advised us that our original approval for a 14,940 head feedlot has no legal standing in the law, and that we should apologize to the DEC for our development. He advised that he knew important people in DEC and that we should begin a long series of meetings which he would coordinate for a fee. His fee for this original meeting, which took 40 minutes, was $4000. Since we had never done anything wrong, and because we could not afford to pay him on an ongoing basis, we declined his further involvement. In 2009 we discovered that Dr Johannes Schoombee was the convenor of EDO. EDO listed the fight against Narrogin Beef Producers as a major accomplishment in 2008, and Dr. Schoombee won lawyer of the year partly for his work with EDO. He never disclosed to us or even attempted to allude to any such connection. Matt and Janet emigrated from the US and have bceome Australian citizens since. 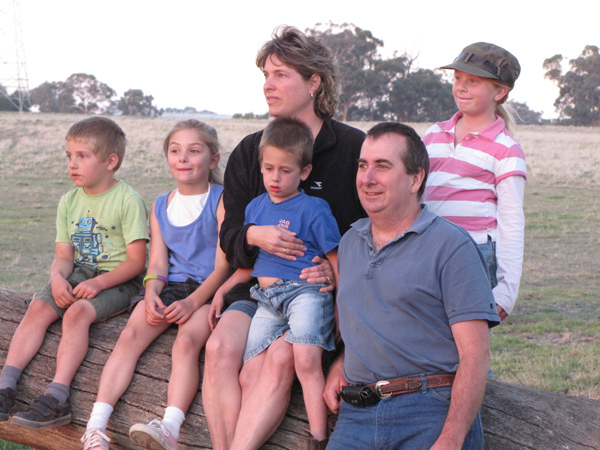 They have four young children, and are popular in Narrogin. When the Environmental Defenders Office slowly collected 300 signatures, friends of the Thompsons responded immediately by gathering 900 in support. Barry Carbon was instrumental in writing the EPA Act of 1986 which is crucial in the Thompson’s case. He was asked to be a part of the Local Community Consultative Committee (LCCC) in Narrogin to look into the situation. He conducted extensive research during 2009 and at the end recommended that the feedlot be allowed to go up to 10,000 head immediately based on that research. When I speak to Matt about his hope for the future, at the moment the thing he wants more than anything is to pay back the debts to the other businesses and former employees, who are part of the cascade of people caught by vague unknowable rules, and who are also suffering losses. Right now more than anything Matt and Janet just want the government to get out of the way and let them get back to work (though it may have gone past the point where this is possible). One new condition on their license “provides that Narrogin Beef is to ensure that odour emitted from the premises does not unreasonably interfere with the health, welfare, convenience, comfort or amenity of any person who is not on the premises”. The main problem here is that the vague open ended rules appoint bureaucrats as de facto kingmakers, and the fact that these conditions were not stated from the outset, but added to licenses after-the-capital-expenditure makes investing in WA a minefield. If Matt and Janet had known back in 2001 that they would be subject to such a regime, of course, they would have done things differently. Back then, everything was so simple. The original Works approval listed them as a Category 68 facility which only needed to be registered, not licensed. The government has, in effect, broken it’s side of the contract. This is just the beginning, there is so much more to say, but naturally the devil is in the detail and the details are buried under cubic meters of legalese and bureaucratania. I will be writing more. This time the bureaucrats have gone too far. Hello, all. Thank you for your interest and your comments. Honest and open discussion is great, and we welcome valid questions and the opportunity to clarify things. First, Jo Nova, thanks for posting this topic. We are blown away by the interest and support that our videos have generated, and hope that, even if it’s too late for us, we can use our horrendous story to help make society better in future. Australia is a fantastic place to live, and Narrogin is a jewel of a place. We love raising our family here, and have many friends and enjoy life to the max in this lovely country town. The small group of complainants exists everywhere, and we do not see this as a Narrogin problem or as an Australian problem. So please do not get “down” on this awesome country! Just get involved to make a positive difference. Elaine @63, just to clarify: We obtained a Works Approval (#3600) from the Department of Environment in 2002, and final go-ahead in 2003, after being on hold over a year. That works approval (permission to build) was site-specific. We received permission to construct a 14,940 head beef cattle feedlot in this location. We’ve had 5 licences so far, and had staged our development, so there is a different throughput noted on each one. Once again, thank you all for your genuine interest and questions. Truth is an important goal, and we are thankful that the Internet allows us to have such open and honest discussions. I’ve been following this story since Ann-Kit litter posted the link on here on Tuesday, I encourage we here follow the recommendation put forward on Agmates. Visit youtube and click on the video’s several times and turn them viral, the more exposure the better. Jo, this disgraceful story echoes what is happening across the country. From simple DA’s for new homes to medium and high density projects for thousands of people, the bureaucrats will have their way. Sometimes a leader will not make a decision until all the team have agreed to the point of absolution for himself. Sometimes downright vindictiveness is the holdup, but how can it be proved that a town planner has it in for you? Many delays stem from time spent interpreting the laws and regulations. The perspective of a planning and environment lawyer is revealing. The sheer momentum of the climate change madness in local and state governments is staggering. Despite recent enlightenments on climate the machine rolls on. Councils are regulating use of “Local Natives” in all for new building approvals. The definition of Local Native plants requires propagation from the local area or provenance. Provenanced seed for forestry is is designed around performance trials using seed from different locations. Provenancing plants for landscape is born of an emotive response to preserving mostly indiscernible differences in plant species in madcap attempts at preservation. Species common in one State are declared threatened or endangered in another, without any concession to climatic preferences. The next thing we will have plant police out there DNA testing plants in gardens to ensure that 80% are local natives! Bureaucrats are regulating failure across Australia, mostly without too much input from our elected representatives. Australians need to take a stand against the tyranny of too much power in the hands of the unelected. Good on you Jo for putting this injustice here for all to see. – words evade me now when i think of everything that the Thompson’s -and their children have been through and are going to go through shortly. But what i want to know is more about these people complaining about the odor – and why did the NFF back off so quickly from helping the Thompsons? Hm “me smells a rat” – can you catch that rat Jo? I think then truly justice may be done. Keep fighting Thompson family – you have stood your ground – people are standing with you. I am disgusted by this vendetta against this family – how Un-Australian can one get, and cowardly – using “for the good of the environment” as a weapon and every legislation / law that they can wield – then that is what EDO and “like minded” people (are they still human??) do. Yep – Senator Helen Polly – “If we give back your property” pg 65, Second paragraph..
Well – hello – doesn’t this ring alarm bells with any one? Of course it does – so what is the public going to do about that? Human society has a capacity to engage in petulant punitive “retribvutive” actions. Somewhere in the collective psyche a degree of gratification comes from displays of “self righteous indignation”. To me this case has all the hallmarks of a modern day witch dunking. It certainly has some parallels in history. I understand in some cases during the Little Ice Age that famines, crop failures & extreme weather events were blamed on individuals, targeted for some perceived social trait & dealt summary “justice”. This is “mob rule” & the agent provocateurs are the blind self important, self deluded do-gooder luddites of AGW faith. Dr Schoombe obviously sees himself as a proud bearer of the sword of justice. Sometimes I think it is a good thing that climate change as it is spruiked will give us a more tropical climate. We will need it to grow all the more pineapples for remedial tropical fruit therapy. Treeman, that statement, “bureaucrats are regulating failure across Australia” is so true! What the Thompsons have endured should not happen in a free society. Yet they will trample on the human rights of some of the most isolated and vulnerable people here: our farmers who feed us. Go to Property Rights Australia, and please support them in their efforts to right these massive wrongs. I have personally met the Thompsons and other affected farmers, one couple was too afraid to speak out. I cried with them and felt utterly powerless to help them. Now, I don’t feel so alone. Says it all right there. Same goes for local government such as all councils, they have no legal jurisdiction as local councils were voted out of power in the 1988 referendum. Unfortunately, state and federal governments weren’t. I could guess which way the vote would go. These things are always sheeted home to “the government”. But really it is public servants who create stupidity and do damage like this. Public servants make the decisions, public servants brief their political masters (their public masters don’t get a look in there!). Public servants in many areas are free to push their personal agendas in any way they like. They create the vague open-ended “rules” which cannot be challenged. They can take as long as they like to deal with matters – even ignore them completely if they like, because if the Minister should be moved to enquire about progress, they provide an appropriate briefing and send the matter back to sleep. I have been in the public service, I have seen these processes at work. But look arond Australia. Where do we have good Government? The system is working for someone, but it is not the honest workers or those with business initiative. The Thompson’s story is a shameful one – all the more so because there seems to be no political will to find out how this could happen and to hold someone responsible. “Public Service Responsibility” – it is time we put some meaning into the concept. We need to draft the legislation and put it into someone’s hands for a private member’s bill in every State and the Commonwealth. Jo, in addition to what you are doing for the Thompson’s, is there some way to send them some financial support to help defray their legal bills? What a beautiful family, and what a shame that this is happening to them by these bureaucrats! The vagueness of the laws and regulations in this area are designed to make it virtually impossible for the citizen to understand whether they are in compliance or not. Ayn Rand, in Atlas Shrugged, wrote very poignantly about this subject of vague and malleable laws and regulations that give the government great latitude to destroy unfavored businesses. I’m going to play the devil’s advocate here. It was clear that the town had suffered from noxious odours from the piggery adjacent to the feed lot which was solved by changes made in the piggery and I assume the extensive planting of wind breaks to the north between the town and the piggery as shown on Google Earth. So clearly before the feed lot was proposed the odour problem was clear and concise. I must say I’m amazed that you would consider building a smelly feed lot within 4 km of a major town on a flat plain where the southerly winds would blow straight through the town. It was clear that no matter what approval you obtained odour was going to become a major problem in the future, as it has. There appears to be no attempt to create the necessary wind breaks on the property that the piggery required. I suggest that the whole project was very badly thought through. More stories will be coming out on this channel. For every rational person who sees this injustice, this capricious act of government and their lobbyists, the madness of it, the sheer insanity here is what to do. Go to youtube. Watch the video. Comment on it. The more times it is viewed, the more exposure it will have. Post this channel or one of the videos on your facebook or your myspace page. Ask them what they are going to do about this. Go and read the recent enquiry into Native Vegetation Control Laws, Greenhouse Gas Abatement and Climate Change Measures. This madness must stop. Our democracy is under threat. We cannot throw our democracy down the toilet. We cannot let the extreme Greens do this to good people. And the last thing to do is: learn about the true nature of the Greens before you cast your vote. They should have a voice, but much like a teenager with no life experience has a voice in the family. They need to be guided and managed. Right now, the irrational greens are managing us. As a follow up to my previous post, it seems to me that Dr. Shoombee should be reported to the Attorney Discipline authority in the district that covers Narrogin over his apparent conflict of interest and possible breach of the Attorney/Client Privilege (which I am sure exists in Australia also), as he may have shared confidential information from the Thompson’s with the EDO. The scenario with Shoombee and the EDO, and their taking credit for the problems that Narrogin Beef Producers had in 2008, seems to be beyond coincidental! Anger. Nothing more, nothing less. Please, take the next opportunitiy to vote for policies, not Parties. That means the Candidate’s policies, not a Party rubber stamp. And tell any candidate “no policies, no vote”. This country is, unfortunately, overdue for revolution. I live in Brisbane but am horrified at the disgusting treatment of this family. It is happening to them now but if left unchecked it will be happening to anyone in any state, QLD beware. It is actually in the farmers best interest to look after the land and stock and nurture them to produce more product. They are trying to stop them using the land to its full potential and not offering any compensation. If you take something from someone and do not pay for it then you are stealing, if you are not going to pay for it then give it back. This debacle was bought about by the Greenies who think it is all about an organic garden, well here is a Green Thought for the day made simple for Greenies to understand: You will no doubt have borrowed money from the bank and bought a house and intend to set up an organic garden to grow food as a business to pay the mortgage and feed you and others. This seems to work out on paper, you and the bank are happy. Now try growing the same amount for the next 5 years but you are not allowed to clear any weeds away, all seedlings of trees must be allowed to grow uninterupted. If a neighbour reports you for creating a smell with your organic fertiliser (cow muck) you must allow half of the land to go back to nature to reduce the smell. Now you can only use a small part of your block now, the food is not being produced, you have nothing to sell, the banks want their money. Now imagine this on a scale 100 or 1000 times bigger. You stop the farmers using the land to it’s full potential, the land is worth less, the banks take it back. If it is allowed to become a national park it will be overrun by ferals (pigs, goats etc) The farmers have an incentive to look after the land. Why then did the feedlot get approval? Why didn’t these protestors take their ire out on the State Government that granted the original license? Odour is a very subjective thing; the time for protest was before the license was granted, not after the banks and others had invested their money. Changing the rules after the horse has bolted is wrong under any circumstance. It is my hope that adequate compensation is forthcoming to the investors and that this never, ever happens again. The EDO should focus on the government, not on private business. The majority of owners in the area were and are supportive of this business. What is to stop a small group of squeaky hinge serial whingers from following a similar course of action against every major sewerage treatment works. Treatment plants in major centers employ both aerobic & an-aerobic digestion techniques to consume organic substances; biological oxygen demand (BOD) in a (liquid) contained process. These plants are in the open & open to the atmosphere. The digestion of organic waste materials, BOD is not an entirely odour free process & in the cases of anaerobic digestion of sludge, produces significant quantities of methane. Admittedly this methane is in more modern plants harvested & either used for power production or burned. Either way its carbon ends up back in the atmosphere as a terrible GHG. Perhaps the nearby residents should lobby to defend their rights & have them enshrined by changed legislation. Maybe the taxpayer should have to prop up their real estate values. Better still shut all the sewerage systems down & go back to dunnies! If there was any equality in the justice system the squeaky hinges would result in the immediate construction of some multi-hole dunnies out the back of the various parliaments in Australia. Who knows they may even double as forum for a quorum. It might even raise the tone of the debate. to sort this out. They stand to lose as well. with the original permits being given. If now the authorities want to change their mind then compensation to everyone is due. I think that this has more to do with proving (yet again) that the 75 year experiment that became known as the USSR (Russia) is not dead and buried. Where to now for the principles of equity now that these principles have been reduced to the intangible asset of nothing more than “A Stakeholder” of a lower class behind that of “Other” so-called non-equity stakeholders. At this rate it won’t be long before a permit or licence is required for every facet of our daily lives, including the morning ritual of visiting the ‘outhouse’. Imagine the outcry if someone in a position of authority had gained approval to develop land for housing, had put the roads and sewage in etc and was then told it had been blocked. No compensation, no appeal. There would be headlines in every paper and TV stories supporting them. The difference here is that they are just farmers, I live in the city and would starve without farmers. If it carries on we will all be eating imported produce of a lesser standard. They have been unfairly treated and there needs to be an investigation into the Greens and the Lawyers involved. Ask any Queensland farmer about the level of vindictiveness, and the abuse of power, that occurs if you dare to stand by your rights and backchat the tree police. The problem is if you attempt to stand by your legal rights in a court of law, you are up against a government blank cheque. In most cases it is cheaper just to wear the fine, than attempt to prove your innocence. Remember under the Queensland vegetation act you are guilty, and must prove your innocence. This appears to be yet another example of how an obese and bloated bureaucracy will manage to be most efficient at screwing something that is essentially quite simple to the point where any semblance of common sense or decency becomes irrelevant. Yes, the location selected should have been better considered, but the bureaucrats did approve it initially, so compensation is required to the people involved (and responsibility in the form of sackings for the bureaucrats who were involved in the initial approval of the development). Of course, this is too simple for the bureaucrats to understand or approve, so now the Uber bureaucrats (commonly referred to as lawyers) are involved, it will probably mean that this will drag out long enough for these good hard working people to have years of their lives sucked away for no good reason. But don’t worry, at least people who are unemployable in the private sector will have something to do – even if it is at the cost of a producer. We can multiply this problem a million fold with any form of ETS, that’s for sure. Heck, the Dept of climate change is burning up $90Million a year without them having anything to do! Different perceptions on feedlot smells. At one stage I was in a town about 15 miles west of a major feedlot. And when the wind blew from the east anyone mentioning the smell to locals got the response of a deep breath and the comment “Sure smells like money to me”. I also suppose that a graduate from that agricultural college would not be up to speed in feedlot management through lack of opportunity to train in intensive animal industry at the college? A society with too many vaguely written laws gives unrestricted power to the government. No matter what act a citizen performs, the government can always find a law for which the action appears to be in violation–at least requiring a trial. If two people perform opposite actions, the government can pick law 1234567 to treat one individual as a law breaker, and pick law 7654321 to treat the other individual as a law breaker. By choosing which laws apply to a situation, the government can prevent any actions it deems inappropriate. I always appreciate your thoughtful contributions. Recently my wife and I took a beef tour through QLD. We visited a 10000head feedlot outside Dalby. My comment after an extensive tour of the facility was how clean and odour free it was. The owner took pride in his cleaning routine and the use of the scrapings as fertilizer for his home grown grain crops. It is possible to maintain an odour free feedlot and from what I could deduce from the Thompson videos they were doing everything best practice. Conversely, I used to live in the Upper Hunter Valley and a local issue was the odour emanating from the “Parkville Piggery”, once part owned by PM Keating. The main difference between a cattle feedlot and an intensive piggery is water use. Piggeries are washed down on a daily basis and the waste collects in settling ponds. These ponds generate the same gases and odours that a sewerage treatment works but without the constant aeration. Feedlot waste on the other hand is relatively dry and when properly aerated is virtually odour free. It’s the water that causes the problem. What if the well established piggery was the real culprit but the new feedlot was the target for blame. It would be interesting to see if the offensive odours are still present even after the feedlot has ceased operation. I also advocate the suggestions of others to send those videos around the world. Anyone thinking of setting up a project in Australia should be made aware of the pitfalls of our bureaucracy. The Premier of WA should be the first recipient followed by every member of the government. What has the local member had to say on the issue? What has happened to democracy when 300 disapprove but 900 approve? Most governments are elected with only 51% not the 75% in this case. Shameful. Lawrie – as I understand it the piggery went through the odour problem with the town and authorities and managed to solve their odour problem – this was well before the feed lot was added. Please don’t get me wrong – I have no respect for the outrageous actions of some of the green influenced government agricultural bureaucracies, I could tell you of similar stories that have occurred in my region, a farmer being fined thousands of dollars for illegal clearing on his property where over 50% of the land has been turned over to tree plantations and he was just clearing regrowth to turn back to pasture for the seed that he exports to Dubai. Might I suggest that every Green candidate be sent a copy of this and also send a copy to every paper in every Green candidate’s area. I would also send a copy of this to Alan Jones, Jim Ball, Ray Hadley, Jason Morrison, and Chris Smith. This then will cover every session on radio 2GB. I can assure you that you will get great publicity from the radio station. One of the major issues is the lack of oversight when it comes to getting approvals/licences processed. DEC and other agencies can literally stand on the hose with very little chance of reprisal. There is a distinct lack of transparency when it comes to many approval processes. The conditions regarding odour are ludicrous… there is no way these could be assessed transparently. Narrogin is a country town that lives, eats and breathes farming, and a lot of the complaints were apparently coming from a neighbouring agricultural college… I mean seriously. when in the country I expect to smell country smells. BTW pull up Narrogin on GoogleEarth and pan 4-5kms south to see where the property is. PS> Ironically Barry Carbon works for Bauxite Resource Limited now, and they have managed to stir up regional communities against them. Earth to Molly – The Greens are not in Government in WA. The Liberal/Nats have a clear majority so maybe folks would be better writing to them? feedlot was adversely affecting staff and students at the Narrogin Agricultural College, many of whom live in residential accommodation on-site. At a cursory glance, this looks like what we may expect regularly in the future with the uber greens now in control of so many sections of society. With so many marginal seats in rural and regional areas, I would have thought the Liberal national coalition could make something of this. Don’t underestimate urban Australians, they still have strong affections for farmers. Thanks Ruth Bonnett for the link. I looked at the Greens site and found this reference to “freedom of expression” but most of their concerns are for UN proprosals, there is no stated interest in the rights of Australian citizens. Huh? What sort of subjects do they teach at an agricultural college? Hairdressing? IMHO, odours from agriculture would be an enhancement to the coursework. The people responsible for that argument at the Department of Education should be laughed until they feel as stupid as they are. Now look what the Department of Education made me do: mis-type my name. I cannot comment on the justice or otherwise of this particular case. But it seems clear that our Governments have a long way to go before they could be said to be acting with goodwill toward all citizens. At the moment they listen only to people (or, preferably, to groups) who “know the ropes” about how to create the right impression, who to speak to, how to word their approach, and how to write an application in the right way. For the Left and their favourites, help with these things is always available through partisan bodies like the EDOs. But the rest of us are on our own. If you go into a government office and don’t know what to say, you’ll probably be left standing there dumbly. If you have to apply in writing, no-one is going to help with the words. It is disgraceful that the EDOs, although nominally non-government organisations, have special relationships with the various State governments. The Environmental Defenders Office of South Australia (Inc.) states on a recent brochure that “this project is supported by the Government of SA”. Janama, you make fair points. I wondered that myself and have gone through the $15,000 odour assessment report data – which covers months of daily recordings, as well as the original public application for the feedlot (which was popularly supported). I also know from the Thompsons that the Department actively contacts people to enquire about problems and complaints, which could be seen as the dept doing a thorough job, or on the other hand, by a department soliciting complaints. There were few complaints before the Thompsons made their skeptical views well known. The big problem with this is that “smell” is so hard to empirically test and assess, yet a families livelihood can be held to ransom and it’s impossible to know if their business is better or worse than other places and the problem is being vexatiously exaggerated, or if the problem is real. Comments from people in Narrogin would be most welcome. Yes, perhaps it was not the place to put a feedlot, but in 2002 most of the townsfolk didn’t seem to think it should be opposed, they supported the application. As far as I can tell (with limited information) most still do. The piggery doesn’t seem to have been shut down via bureaucratic torture. The rulings have changed so frequently and unpredictably, no one could manage a business under these circumstances. Sure, if there was a verifiable problem, the answer is to resolve it quickly, and if the piggery and the feedlot need to be moved, pay compensation for misleading Matt and Janet into thinking that that site was the right place to put it. 18 months to resolve an appeal on a 2 year license while the business is forced to lose money is not a government interested in promoting jobs, industry, investment, or just giving people a fair go. One thing that springs to mind after viewing Food Inc a couple weeks ago, is whether DEC might have reservations about this particular type of farming. The high-intensity farming practices in the US as shown in Food Inc were quite appalling to behold. I have no idea how similar this feedlot operation was, but is this a potential regulatory bone of contention? To Joanne Nova: Thank you for investigating this story, more people need to know what is happening to our farmers and farmland. The best caretakers of the land are the farmers, their future (and ours)depends on it. The farmers need our support because without them we would starve. Bring in the food from overseas they say (complete with chemicals and diseases). We have a very high standard in Australia, why settle for second best, aren’t we worth good food? Legislation has gone mad. One example of this was given to me about a peanut farmer who complained about the quality of imported food that was allowed in. To prove a point he applied to import some peanuts and they met every requirement of imported food standards. He then applied to export the very same peanuts, they were not up to the Australian export standard and they refused a permit. By the way, I’m not an affected farmer or related to one, I live in Brisbane but know when something stinks and it’s not the feedlot…The banks must not be allowed to take over the Feedlot until there has been a full investigation into this farce. For my part I have taken the time and effort to become relatively fluent in Enviro babble. My landscape has become environmentally degraded, and large areas of it have degenerated into a monoculture. Therefore I propose to intervene mechanically and re-establish the original biodiversity. I expect this to enormously benefit all native flora and fauna in the area, particularly the small marsupial ground dwellers. As the general environmental health of the area improves, it will also enable some commercial livestock raising in a carefully controlled manner. Economic gain from the livestock will enable further employment of local indigenous people. This will have the triple bottom-line effect of improving the economic, social, and environmental, bottom-line of the area. The country has become overrun by useless bloody scrub. So I intend to get a couple of big bulldozers in and pull all that Scrub. So that some grass will grow and I will be able to fatten my bullocks on it, and make some money. I will need to employ some black fellas to help me muster all those fat bullocks, so it will be good for them as well. Also all the little native mice will have some grass to hide in and eat, instead of the bare ground that is now under the scrub. Where I come from the local aboriginals refer to themselves as black fellas (I’m a white fella) They genuinely dislike being called aboriginals. Matt B Did you read the decision made 30 years ago by the environmentalists to govern by default. The plan to invade positions of power has been accomplished and they make decisions for the politicians who leave things in their hands. Yes I do recommend that all polliticians in WA be targeted with the above facts. I have sent the info to Jim Ball of 2 GB and he informs me that he placed it on his home page last week. Great enviro-speak, Binny! Very funny. I agree with the blackfella/whitefella thing: I always suspected that it’s only the academic, city-dwelling lefties (black or white) who insist on politically correct labelling like ‘indigenous’ and ‘aboriginal’. By the way, when is a whitefella “indigenous”? How many generations back does he have to trace his ancestry in Australia to qualify? Or could it be that he will never qualify because he is a whitefella? In which case, where would he be considered “indigenous”? In, say, England, where he might never have set foot personally? (Gillard) “I have consistently said … climate change is real, it’s caused by human activity, we will as a nation need a price on carbon, to get there we need community consensus. Mr Abbott, who was also in Brisbane today, said he’d like to see Australia’s emissions reduced, but added: “I don’t believe we should turn our economy upside down in order to do it. “We’ve only got one planet and we’ve got to look after it,” he told ABC Radio. He said other countries would have to act alongside Australia for an emissions trading scheme to have any real effect. “I think that there is an evangelical fervor to some of the climate change affirmers,” he said. “I think in the end we’ve got to be pragmatic and we’ve got to be scientific about this, and the scientific consensus is not nearly as solid as the climate change zealots would have us believe. WWF climate change spokeswoman Kellie Caught attacked Ms Gillard’s inaction. “She has continued Labor’s backflip on climate change and ignored the public’s sentiments on the one thing that will truly cut Australia’s pollution – an emissions trading scheme,” she said. The Greens have promised to secure a carbon levy if the party holds the balance of power in the Senate after the next election. “We are committed not just to accept a Abbott government that says they won’t have a carbon price or a Gillard government that says we’ll delay it for three years,” Greens leader Bob Brown told reporters in Canberra. “We Greens are more business savvy, more climate change savvy, more jobs savvy than that, and we will have it, I confidently predict that. RESERVE Bank board member Warwick McKibbin has called for a dramatic new approach to combating climate change. The proposal is contained in a paper launched at the Lowy Institute in Sydney, co-authored by analyst Greg Picker and lawyer Fergus Green, both of whom participated at last year’s Copenhagen climate change conference as negotiators. The co-authors argue the current approach through the UN is failing due to the need to build a consensus among 193 member states with competing self-interest. how desperate does McKibbin sound? I haven’t finished reading it all yet, but while I was reading I was reminded by a light breeze from the south, that in Cairns where I live, there are two sewerage treatment plants…. one to the south in Portsmith and one to the north near Aeroglen… In a Southerly breeze at night there is a strong and unmistakable odour from the Portsmith plant… and also the Bedminster recycling plant…. and if you drive up to the northern beaches, you pass through another zone of unenviable odour. However… I don’t see the Sewerage and Rubbish recycling industries the City Council controls being closed down… Seems there is laws for one set of folks and another set of laws for us more common folk. It’s a shame what has happened to Australia…. a once enterprising country full of industrious busy people. Gone now and replaced with Bureaucratic shepherds of the Australian welfare flock. ….. That’s what really stinks. I agree with Peter J @12. I was a public servant for 19 years. It’s surprising how much power can be given to someone in a lowly position. When I was at the bottom rung of middle management I was given the task of deciding who should be recommended for prosecution or not for refusing to complete their census form. Given all the nonsense I’ve learnt in recent months about issues relating to climate change thanks to the magnificent efforts of McIntyre and McKitrick and of Jo Nova for putting lots of it into “English” with the Skeptics Handbooks, it would not surprise me if the Thompson’s situation is more the result of public servants looking to gain brownie points with their bosses than anything else. I visited England in 1988 and spent a few days in the rural south west in Devon and the farmland odour was like nothing I’d experienced, but I soon got used to it. Common sense and the Greens – mutually exclusive! “This is just the beginning, there is so much more to say, but naturally the devil is in the detail and the details are buried under cubic meters of legalese and bureaucratania. I will be writing more. Absolutely Jo…. I am outraged. This is a travesty of our country’s once proud character… This is bureaucratic malfeasance at its worst…. and an example of the Eco Fascism that is now standard in this country. Whatever can be done for the Thompson’s, must be done. No person of enterprising spirit should be broken in this callous, crazy making way. Fugging green so and so’s. They have gone to far this time. To think that the eco fascists have an alliance with the bureaucracy and can destroy any who speak out against their Ideology and get away with it… It’s an abomination of our Democratic system. It is very disturbing that our system is so easy manipulated and corrupted by people of malicious intent. It seems that a program set up to attract rent-seekers gave rise to rorting… quelle surprise. I stand correct, The Department of climate change is doing something – they’re unwinding the green loans scheme. Sorry, my mistake. Maybe they can unwind their remuneration while they’re at it? …and replacing it with another scam *cough* I mean scheme. Rebadging the scheme will take plenty of bureaucratic person-years. This farmer’s submission had to remain confidential. Watch this video as many times as it takes to sink in. I have witnessed some fairly average things in my life, but this attack on some of our most isloated, vulnerable and decent people is too much. I am sick. There is much, much more where this came from, so keep checking the PRA channel. I am going to agree with Janama on this. I run a beef cattle property so I have a fair idea of the problem. If you have every been near a feedlot you would not forget it the stench is indescribable. To site this 4kms from a town and not expect problems suggest the couple involved may not have had a good understanding of the issues involved. With regard to permits and approvals too many farmers have been burned in the past and now most farmers would not proceed with a high value investment on the basis of an informal acceptance. It is sad to see anyone in this predicament but unfortunately the Thompson’s should not have accepted informal advice from bureaucrats, who generally are clueless, and they have to bear part of the blame. For my money it will have had a huge bearing on the way the faceless treated the Thompsons. The non vindictive bureaucrat is a rare species and this story stinks of vindictiveness. That rulings can change depending on the whims and fancies of the faceless is an inditement on the systems and regulations under which we live. J.Hansford sums it up well. Drive around Brisbane and breathe in the primary sewage treatment smells. Drive on the motorway behind Palm Beach and turn off the air vent so you don’t choke. Take in the disastrously managed water infrastructure works in SE Queensland and you might just glimpse the tip of the iceberg. The hypocrisy of those “in charge” is breathtaking. I too am a livestock owner – beef cattle. I have been to the Thompsons property. It is state of the art facility. So far i have found NOTHING in Western Australia that compares to it. The research that this couple have completed prior to their financial investment, hard work, attention to detail, environmental requirements, is above and beyond what is required. No – this is a personal vendetta against this family. They did their “homework” and are equally qualified with “hands on ” experience. There is no blame to be attributed to this family in any way shape or form. This is bureaucracy out of control. which subject to a number of conditions including odour control limits the stock to 10,000; I haven’t watched no 2 of the videos but I thought 10,000 was the number the Thompsons were aiming for; am I wrong? but can someone tell me what is the number of stock which was to make the project viable? The Thompsons were looking to raise the licence limit to just under 15,000 head if memory serves. I think they were already at 10,000. BTW that is a bit harsh Treeman – I work for the civil service, albeit a very progressive department in WA charged with the facilitation of major projects. We certainly don’t have vindictive members in our crew, but then we aren’t a regulatory agency either, which means we are a lot more flexible than most. You’d be happy to know I make no secret in the service of being a climate skeptic. I too have worked in the public service as well as in private industry prior to my retirement. The main difference is that in the public service you get ahead by not making mistakes. The best way to achieve this is to do as little as possible and avoid anything controversial. I would suggest that one of the reasons for the delays was that the minute this became an environmental and a political issue it would have been dropped like a school case by anybody anywhere near it and any chance of a decision would have become difficult. As a self-employed person I only get paid when I’ve completed the job satisfactorily and on time. Even then it can be weeks before I actually get the money in my account. If the public service had to endure this, they might start functioning properly. That’s not to say that individual employees are incompetent,- it’s just a feature of gangly bureaucracy. It says that Thompsons asked for 10,000 head, which is what the Minister allowed in the appeal. The Minister also seems to have said that they need to ensure odours don’t unreasonably interfere with sensitive places outside the feedlot – that seems fair. Property rights don’t exist in a vacuum; there are responsibilities as well. And Joanne, pages 7-8 of the report show the history of the approvals, and I can’t see where the Thompsons ever had approval to have 15000 head – the original DEC approval in 2002 set the number of stock at 5,000 head with staged increases subject to performance. Fair enough to criticise the DEC if it is warranted, but the facts don’t support the premise that approval was given and arbitrarily taken away. Joanne, I respect you greatly, and this case is very worthy of debate. However, if you are saying that this case is entirely a beat-up because of AGW skeptical leanings, then you need to prove your case further. I hope that it is not what it may appear: this family’s bureaucratic nightmare has been hijacked by well-meaning skeptics. You may have valid points regards the subjective and temporal effects of the feedlot wrt ambient stink. But to tie this to the family’s political/environmental persuasions wrt AGW is yet to be demonstrated. And therefore I reserve my support, with respect. Joanne. This story rings true as a nasty act by government activists. Here in the UK the best results seem to be achieved by naming and shaming. The Thomsons should get the names of everyone in the Government departments involved and publish their actions and words. It will take time but it will get closer to persuading Government to do something. You could be right and Jo wrong. Coincidence does happen. On the other hand, smoke comes from something burning if you understand the metaphor. Unequal treatment of one farmer in the area is smoke to me! Private property is under attack not just in Australia but around the world as are politically incorrect views. You’ll make whatever call you want to and that’s your right. But it flies in the face of the evidence. Though I live in the U.S. I’ll stand squarely behind both the Thompsons and Jo. It’s high time not only to speak out against this kind of abuse but to demand an end to it. You seem to miss my point. To say that these people are treated unfairly is one thing. To say they are treated such only because they expressed views contrary to the politically correct is a very alarmist (if I may say so) point of view. My point, therefore, is: please provide more evidence of the latter. Otherwise you do more harm than good to the argument against AGW alarmism. Mike, I am aware of that and worded things carefully. I said that conclusions were impossible to draw and merely highlighted the rough coincidence of the skeptical speech and the turning point. Things were going ok for them up til early 2007. Whether Matt and Janet have been grossly unfairly treated does not hinge either way on them being skeptics in any case. Either they ought to have been given a fair and workable license in a reasonable timespan or there are problems that needed to be resolved – which may include compensation/relocation. Matt and Janet complied with every request that they could. The behaviour of lawyers who work for the team which attacks a business, then take money from that business in order to defend them from attacks surely is a red flag? In any case, Matt and Janet tick quite a few unpopular boxes on the radar of activists – intensive cattle farming and “being American” (by birth) won’t earn them friends in most greenie circles. But unknowable motivations are not the main issue, and I didn’t make them out to be. My main concern is how complex our laws have become and how that leaves room for potentially exaggerated or even invented complaints to hold a veto right of the worst kind over other peoples lives. If activist groups stop a project before it starts, that’s one thing, but to allow people to invest their lifes work and then potentially use spurious baseless claims to destroy that work is something much more insidious and is a loophole a mile wide that is bound to be exploited (if it hasn’t already been.) I want evidence based laws. Outcomes and markers that can be measured, and if it’s unmeasureable but important, then we design new laws to reduce the likelihood of a conflict. If Matt and Janet arrived in Australia and there was a simple law like: “intensive animal farming is only permitted with a 20 km buffer from townships”, don’t you suppose they would have just picked a different site? Even better, if the simple rule meant that didn’t need a whole year to get works approval, they would be a whole year ahead in generating jobs, income and food. I don’t think I missed your point. Keep your eye squarely on the unequal treatment of one farmer in the area beginning soon after their politically incorrect views were known. Read the handwriting on the wall, Mike! Failure to do so has been the downfall of kings, presidents, prime ministers (ring any bells? ), businesses and even nations. If this was the first time I’d seen anything like this I’d stay silent. But it’s not. It’s going on this very minute as I write this in the so-called City of Brotherly Love, Philadelphia, Pennsylvania, USA. I heard an update on the situation this morning from the man who’s business is the target. And who is after him? No less than the City of Philadelphia. His crime is a sign he posted at his steak house saying please order in English. He was sued for discrimination and won the case hands down in court. Not satisfied with that, the city embarked on a crusade of harassment. Restaurants in Philly are inspected about every two years. His has been inspected four times this year alone. The infractions are any trivial trumped up thing they can come up with. I can recite other cases but I think one should suffice. I rest my case. This is ubiquitous and as pernicious as anything ever could be. It’s time to take back control of our own governments and their unaccountable agencies. It starts with exposing this stuff and demanding change and it continues at the ballot box until the situation is changed permanently by running the guilty out of office. Sad story. In my farm country, 100,000 head is a large feedlot. I suggest for people to live in the country and accept the risk of smell. If I live in the city, I accept the risk of diseases from snotty kids in daycare and even germs in hospitals. Legally, a civil society doesn’t play games with permits and use delays to mess with people. They also don’t grant permits and backout later. meanwhile, back at ABC, i foolishly switched on Radio National for the 11pm news last nite and got the final 2 minutes of a one-hour repeat of once-proud-sceptic philip adams talking to james hansen, with hansen ending the interview saying “contrarians” stole the UEA emails last november; adams then signs off in his sarcastic best noting that was james hansen, head of a conspiracy to bring about world govt. ABC – the place where CAGW never ends. Stinky environmental politics | Watts Up With That? Australia is getting a reputation for destroying civil liberty. When is a democracy no longer a democracy? A nanny state? I think Australia may have arrived. Sad for OZ. But unfortunately environmental siphonomics has taken hold in many Western countries and it seems impossible to do anything about it about these business destroying parasites. There is much talk of whether feedlotting is a safe and responsible production practice. I believe that this is not an appropriate tack within the context of this discussion or our over-all problem, but since detractors will continually bring it up, I’d like to respond. First, feedlotting is not an illegal practice, and any animal welfare or food safety issues should be dealt with separately from environmental issues. Animal rights activists make up a good portion of the movement against us. We welcome genuine people interested in the truth. The animals in our facility were treated very well, fed freshly-produced feed every day, and had an unlimited supply of clean, fresh water. They were happy, content, and always treated humanely. When one of our enemies reported us to the RSPCA, I proudly gave the inspector a 1.5 hour tour of our place. She was highly complimentary, and said farmers should get their story out more, because ours was a very good story. We’ve actually given many tours to the Ag School classes, we’ve spoken to the classes at the school (as late as late 2009! ), and we’ve had many students work with us. Our relationship with the students and staff of the college has been wonderfully positive. Not so with the few administrative people who are philosophically opposed to progressive agriculture, and the top guy who is an adamant global warming advocate and attacked us at one liaison group meeting for our greenhouse gas emissions. 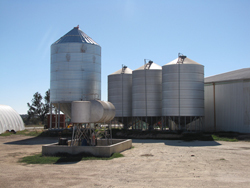 Second, the feeding of grain is commonplace, whether animals are in the paddock or in a feedlot. We would not have the necessary year-round supply of cattle to keep abattoirs in operation were it not for this practice. The feeding of grain to cattle is proven safe and effective, and it has allowed us to significantly improve efficiency, which is great for the environment and for continuing to feed the world. I’m very proud to be an environmentalist and one of the true “greenies,” who understands that the better we get at producing efficiently, the more land and resources are available for environment. Third, Bulldust has mentioned Food Inc again, which is an atrocity of mis-information. We use antibiotics to treat sick or injured animals that have bacterial infections. We probably use antibiotics more responsibly than humans do, because we recognise that they will not be effective against viral infections, and would waste money were we to treat all with antibiotics. Our wonderful employees (and us, too) walked each pen every day to check for sick or injured animals. We taught animal handling techniques based on Temple Grandin’s “flight zone” concepts, and animals were calmly and quietly pulled out of the pen for treatment. A high tech and sophisticated regime for every possible health problem was in place, and a “hospital” was available for those animals that needed additional care or treatment and who could not go “home” immediately. And, we’d like to point out, our well-designed and well-run feedlot is not the exception. We’ve been to many feedlots the world over, and have worked extensively in feedlots and saleyards. The overwhelming majority of producers care deeply for the animals in their care, and spend significant resources training employees in how to properly care for these creatures. Cattle in feedlots are happy and content. If that were not the case, they would not perform well, and everyone involved would lose money. Just as getting better at production is good for the environment, taking better care of our animals and employees is good for the bottom line. It truly is a win-win situation. How exciting is that!? A shocking tale. My sympathies go out to anyone buggered around like that by the government. The one thing that really sticks, though, is the clear case of malpractice by the environmentally-connected lawyer. This should be followed up. I know little to nothing about Australian law specifically, but I don’t think there’s a single Western democracy where an advocate is permitted by his professional body to conceal conflicts of interest. In the UK, there would arguably be a criminal case to answer for attempting to obtain money via a deception – there is a lot in common here with some types of the long con. At the very least, you surely have a case to have the paid fees refunded, with interest. I have an hypothesis that needs testing. Young people with almost a messianic ardor for immortality are bypassing the workforce and entering the do-gooder brigade. They have no practical nous and fall for every imaginable quick-fix that comes down the pike. We see this in career politicians who may be academically clever, but totally lack the simple life skills manifested by practical people. This to me appears to be the problem in W.A. and elsewhere. I sometimes think that things won’t get better until everyone who attended a University in the 1970s has retired or passed on. I think people who were there will know what I mean. That feeling of changing the world was an incredible rush, an extremely addictive. And there are definitely people who have never shaken that addiction, they NEED to be part of a cause…. any cause, but preferably one that will save the world. Janet, you remain up beat even with all this! I can say plenty which would merely echo what has already said. What hasn’t been said is a positive comment on your four bright-eyed children and their future in anything (but especially politics) where they can use the experience they have had already. They will do fantastic! I agree with Roy that we in the US have a great deal to learn by watching how these things compare to what is beginning here. Thanks for clearing up some points. When it comes to movies like Food inc and any of Michael Moore’s I always watch them with a handy pinch of salt… well more like a pail or two, but you get my drift. I was just wondering out loud whether feedlotting was a practice that DEC is opposed to in general, and perhaps they are trying to quash it through regulation or whether your operation has been singled out for “special” treatment. If the latter, then I would have thought the Ombudman’s Office would be able to assess the bias. I certainly agree that DEC should not be approving an operation and deciding after the fact that it was a bad idea and regulating it to death. Most of the blame clearly lies with the regulatory agency as they are the ones with corporate knowledge of hundreds of similar enterprises. They should therefore have known a priori whether odour was going to be an issue or not. Licencing it through new onerous conditions several years down the track is simply unacceptable. I read the condition on odour and the way it is phrased it is what we in Government call a “motherhood statement.” No way that condition could be regulated objectively. It gives the regulator far too much flexibility in interpretation, which means high risk for the operator. Now I’m a greenie and personally loathe intensive production like this (although I am not a vegetarian it is the kind of operation that makes me consider it). I 100% agree with the principle that an approval is an approval and should be honoured. However… life and business is a bit of a gamble, and if I were infesting millions of dollars then REGARDLESS of approvals there is no way I’d knowingly develop 2km from a residential community with a track record of complaining bitterly about odour from the property next door. The comment is that the rural subdivision was cheap because of the piggery… well I’d wager that the feedlot was “cheap” because of the piggery and the whinging neighbours. Personally my spidey sense would have been tingling that this development was a high risk development indeed. That wasn’t exactly my point but after reading what you said I’m glad for once that someone put words in my mouth. It’s a problem that surely will get worse here. You have lots of friends who will help. If what I saw when Peter Spencer went through his hunger strike is any indicator, Agmates will be getting the word out to all the right places, organizing rallies and doing whatever else it takes. So take heart and don’t give up. “Bryan and John” have something to say about the combination of greens and power. Work is busy at the moment but I’ll post it tomorrow. Have you not ever been under stress my friend? Hm, when you have no income, had to lay off employees, had family breakups, and the ultimate – a tragic loss of life by suicide? Well count your blessings if you haven’t, however if you have experienced these things, i know you will understand if things are mis interpreted by readers, or indeed, written out of order with no ill intent. I will write again, this family – Mr and Mrs Matt Thompson – have complied FULLY – with everything that was required of them – and then some! How about you check out how long the “residents” down the road have been complaining my friend, not only about the feedlot or piggery? I wonder if Lindley thought “life and business is a bit of a gamble“, well he is dead, Matt B…as a result of this vendetta and bureaucratic BS…and here is another tragedy – i am sure you would agree…. Cate – if you read I said I’m on their side – the approval that was granted should be honoured – regardless of my personal opinions on the industry or climate science. But I think it is fair to suggest that the location of the feedlot was a risky one from a business investment POV. I understand your position. But it’s the same old canard that’s been going on around airports for years. Airports were built out in the boondocks away from residential areas. But then over the years housing always catches up with the airport. Suddenly you have people who know the airport is there before they ever buy property, move in and then start complaining about the noise. Airports and pilots – especially pilots — want to be good neighbors but an airplane under enough power to make a safe takeoff is going to make some noise. So what’s the solution Matt? What’s the solution? Have you ever heard the saying, “Think ahead because someday you may need a head?” What if before anyone built housing where the stink or the noise would be a problem, someone actually thought it through and decided that the property should be zoned for commercial or industrial use instead of residential? Do you think that a lot of neighbors complaining about neighbors could be eliminated this way? But what we humans call planning always seems to go down the path of least resistance. Or put another way, it always seems to go down the path that leads the most powerful players to the most money. He clearly desires more community input into Government regulation… so if you happen to have a couple of squeaky wheels as neighbours, kiss your business good bye. Have a good read and another think about it. There was approval granted prior to building. Part of the approval process was a town meeting at which the vast majority supported the idea, as it brought employment and it was and is environmentally sustainable. It is disingenuous to say, after the fact, that they ‘should have known better’. Give your head a shake. They complied fully with everything. MattB, I am sure you agree that the law should be applied equally to all, not capriciously and without good reason. It’s interesting to look at Hansard and read some of the old debates that took place when discussing industrial developments in the state. I paraphrase but the gist of the debate about Alcoa in 1961 went along the the following lines. There was a refinery proposed in Kwinana, and the State Agreement (effectively a contract between the State and the companies enshrined in law) said that Alcoa could not be held liable for amenity-related impacts from their residue disposal as long as best practice was employed. The opposition argued against giving the company carte blanche release from such indeminity, but Charles Court (Premier at the time) stated that it was up to the Government of the day to ensure appropriate zoning around the operation so that amenity would not be an issue. He said you could hardly expect the company to perform better than best practice. Got to love ole Charles, probaly the last pragmatic statesman we had running the place. Interestingly, there has been urban encroachment on Kwinana as the decades have passed, and exactly the same issues are being addressed today. Zoning is a highly contentious issue with huge vested interests pressuring regulators. Some things never change. Roy – someone’s making a quid out of the piggery, the Thompson’s were hoping to make a quid out of the feedlot, some rural landowner made a quid out of the residential rural subdivision. Everyone just wants to make a quid here or there. The airport analogy is valid for the piggery, not so much for the feedlot. Also the “rural subdivision” is commonly treated as the enemy by traditional rural communities, but this overlooks the fact that at some stage it only came about as some local rural type wanted to make a quid. As a, and don’t laugh, an elected member of my local council, we deal with similar mostly relating to inner city pubs and clubs and encroaching residential. Concrete batching plants in residential areas etc etc. It is not a uniquely rural problem. What you will possibly find is that the local council had no right to refuse the feedlot as the zoning was appropriate in the planning scheme – but that council really should have seen this coming and done all it could to get the feedlot in a better location. The council approved the subdivision that is where I’d be pointing the blame stick in this case. The DEC, jsut as with inner city noice complaints, is bound by odour regulations and is required to take action if there are breaches – the local govt approvals are irrelevant. At the risk of going on I’ll go back to inner city noise. You have a pub, a residential goes next door, they complain about the pub. No matter how reasonable the pub may be, if a complaint is made and the health inspectors measure and the pub is too noisy there is no wriggle room the noise regulations are crystal clear. You can soundproof the apartments, but then the development industry are on your back as you force up their costs denying a development opportunity. It is a vicious circle. As one who was once involved in business, I am glad that today I essentially live off my savings and some odd jobs. I would like to go back into business but am not prepared to, because of the risks involved. My lifestyle is one of eking out a living. There is no doubt that we badly need a political change in this country and I am doing my bit through the Climate Sceptics to achieve that end. Unless we act, this nation will enter into a slow decline, which will further accelerate with the introduction of a “Cap & Trade” scheme. There is no doubt, in many spheres, there has been a gross overreach by government and this will cost us dearly in the long term. Governments are fundamentally incompetent: We are cursed with this defect. The government must be held to account. While the government thinks it has destroyed just one business, it is conveniently forgotton that many other potential businesses have been destroyed also, by investors withdrawing thier capital, because of government risk. Is there something wrong with the law that allows a person to make a complaint, knowing that the noise was there. Fortitude Valley in Brisbane is an example. It is zoned an Entertainment Precinct. I think this was done in response to noise complaints. At least with sound you can measure it. Is there any way to measure smell? I think that natural justice should prevail. From the posts above they complied with every little thing they were asked to do, and still punished for it. Matt B I really do hope that you are truthful when who have said @ 85 that you are really on Matt & Janet’s side. It very important to make the point that this family complied with all regulations that was required of them. Once a permit has been issued and as a consequence a young family has committed a major investment, you do not pull the rug from under their feet. This should be a free & democratic country; you are allowed to express a point of view against feedlots and support man made global warming. Free speech should also be respected if anyone expresses a contrary opinion. As someone who lives across the street from a pub and three doors down from a nightclub, it is generally not the noise directly from the the licenced operation that is the problem. I have very little beef with the pub, expect that they wanted to build a 27-floor apartment block on the site which was knocked back, but the real issue is the nightclub. Kids come out of the place at closing time… usually 4-5am on Saturday and Sunday morning and we get all the usual shouting (presumably they are half deaf because of the music), smashing of property, fights, etc… Who’s to blame? The council gives a rat’s arse about it, the nightclub owner certainly doesn’t care, and the coppers are not overly interested in getting involved. The nightclub licence predates the apartment buildings, so the council should never have allowed the apartments IMHO. Not until the nightclub licence disappeared. but then councils love high-density residential because it means a lot of fat, juicy rates, which means the Perth City Councilors can go on periodic junkets to our sister-city in Italy. Incidently one of the owners of the pub ran for council… gee I wonder why, but didn’t make it. I have seen a building inspector close down a job site once due to an argument with the foreman. Foreman said he had a God complex. What had to be fixed? The inspector could not read the plastic on the walls as the writing was backwards and had to be ripped down and re-applied. Chief-building inspectors do get many presents at Christmas. Hi dale, you know there are always two sides to every story – you could probably find the story of a local resident whose life has been ruined by the smells and who can’t sell, lost their life savings etc, wife left them etc etc. But from what is presented here I think they have indeed been harshly treated. I do honestly think on evidence presented however that they should never have been approved in the first place, and that the council/shire’s basic planning has been exposed as poor, and also that the business decision to invest in that location was poor/naive. But an approval is an approval in my books and if revoked there should be compensation for sure. Hi Patriot – Olfactometery is an interesting “science” and I did do some consulting on it about 10 years ago. Generally there is a panel of “smellers” and they will rate a smell against an agreed scale – given that machines can’t measure smell (or they couldn’t back then). A slightly better method IMO is when they sample the air and use an olfactometer which is a machine that delivers a diluted sample or air to the nose of each member of a panel of “smellers” (I kid you not). So you get a smell at 1/100th dilution, then more samples each less diluted than before, with the smeller indicating when they can first detect the odour. And then the average reading of panelists gives the odour a score – a rating based on how much the smell must be diluted until it falls below a “detectable” or “offensive” rating to your average smeller/panelist. Now the nose is clever and it tells you there is a smell, but then it stops once you’ve decided if it is a dangerous smell – there is no point the brain being told again and again there is a smell – there are more things to worry about. The trouble is it means that someone ON the feedlot can actually register the smell as less offensive than someone 2km away as their nose tells them regularly there is a smell as it comes and goes, whereas the feedlotter is immersed in the smell so the nose turns off (unless there is a particular spike). Joe – both foreman and inspector appear to have had god complexes… unfortunately only one was actually god. Water prices have risen as much as 22 per cent this month, coinciding with a $9 billion investment in desalination plants in capital cities. Greg Leslie, deputy director of the UNESCO Centre for Membrane Science and Technology, said there was no technical reason desalination plants could not “stop and start” based on need. Are there any legal beagles out there who know who one complains to about the Dr Shonkees of the world. Would it be the Bar association of Australia? Even if he is legally permitted to avoid declaring his conflicting interests he still has a moral obligation as a member of the human race and a duty of care to Civilized Society, (which I thought we were). The government is considering a range of options, including a national energy efficiency scheme similar to plans already in place in the states of New South Wales and Victoria, the newspaper reported, citing senior government officials it didn’t identify. It is also considering imposing emissions performance standards on new power stations that would ban new coal plants and provide certainty for investments in gas-fired base load power stations, according to the report. As an old power generation bloke I am horrified at the thought of just burning up a high quality resource such as gas for base load electricity generation. It just seems expensive and wastefull. Perhaps they should focus on Intergrated coal gassification combined cycle plants. It would still be much more expensive that using coal directly but it would still allow the use of a plentifull and low quality resource. You know MattB, that is the best post I’ve ever read from you. You finally made some sense and suppressed your usual under-breath sniping. The Grosvenor wouldn’t be an issue at all, that is quite a cool crowd in there, and would be what I call my local. I live diagonally across the street from the Carlton, which shall we say, is a tad more working class. But they are generally pretty good too, and most of the noise is happy drunks. plus they close at midnight on weekends. The real problem child in our area is the nightclub attached to the BWS bottleshop on the corner of Bennett and Hay. The owners don’t give a rat’s about their impact on the area, and like I said, they predate most of the residential development on our block. So I would lay the blame for anti-social impacts directly at the feet of the council for allowing high density population around an established nightclub. This is an independent office that investigates complaints about the conduct of legal practitioners in WA. Ring to check – many things can be sorted out with a few phone calls. You may need to put the complaint in writing. All legal practitioners practising in WA must comply with Professional Conduct Rules established and maintained by the Law Society of WA. The Law Society will take complaints about the conduct of WA solicitors. It does not give legal advice. it is quite clear that the 6000 head capacity has been endorsed by the current Liberal Government, whose coalition partner is the erstwhile National party. Not the types to give in the green moonbattery. The appeal comes to reasonable conclusions. 6000 cap until demonstrated they have met odour guidelines, expansion to 10,000 if considered they can still meet odour guidelines. Sounds amazingly reasonable. Hmm that is a lot of investment based on being told it would be a formality. Lesson there for everyone I think. Yes. Obviously they should have spent more of it on buying the right politicians first. Sadly naive. I’m not sure if you said that in jest Alan:) But you are probably not far off the mark! A casual google reveals that Janet has quite a profile, what with attacking the RSPCA, organising a coalition against animal rights folks, and even a fellow Councillor at the good Shire of Narrogin. PGA representative, she’s even made it on to committees appointed by Minsters etc… so hardly a low profile type. Good on her no point being a shrinking violet. But to me to have those conditions applied by the current liberal minister with the libs at the beck and call of the Nationals, well reading between the lines all I can assume is that they’ve pissed enough people off over the years and have come a cropper. No – but there is a bit more influence over licences and approvals and ministerial decisions. Ah Matt B – i pop out for a while and come back – and you are still at it, ho hum! Now before i question your intentions dear Matt B – i will let you research the odour side of things in direct relationship to the initial 10,000 head capacity that they were previously running at, oh, and also who’s idea was it to have it relinquished to 6,000 head in the meantime..that should do for starters, i know you will enjoy the information that you discover. Oh, does that mean you “google” everyone? How amusing..oops, dont come a “cropper” cobber! Cate you are reading too much in to this. I think they should be able to operate at 10,000 head and be given a period of time to demonstrate they can do that while meeting odour guidelines. I think the DEC and the Minister are being a tad unreasonable. What more do you want. Excuse my interest in the kinds of things that lead to such situations. As for google – well excuse me for being interested enough to find some background information, like the Minsterial rulings etc. Ok so google popped up some other media coverage etc that helped build a picture too. I’m hardly being an invasive private investigator. I think I’m being utterly even handed with this one sorry Cate. Typical. Play the man and not the ball. Um Matt…they met the guidelines regarding odour…the DEC keep moving the “goal posts” every single time the Thompsons meet the specifications (not to mention the voluntary initiatives that they have implemented themselves)Can you find any documentation on that? Exactly Roy, I live within 20 minutes of an airfield that’s shared by the military and civil aircraft, the surrounding area used to be mainly dairy farms. Over time a lot of those farms have been redeveloped for housing. Residents in these estates start making noise complaints as soon as they move in, as this airport is one of Australia’s main defensive facilities on the east coast any noise generated should have been self evident prior to any one setting up home in these areas. I believe some people buy cheap in such areas, believing if they make enough noise of their own these facilities will be closed down raising the value of their own investment. Yes, we had a classic case where a woman bought a house near a rubbish tip and then successfully campaigned to have the tip shut down. She scored several hundred thousand dollars from that effort at the expense of the other ratepayers who had to fund a new very expensive waste disposal system. I have no doubt that they have pissedoff enough people over the years. The level of vindictive corruption amongst the watermelons in the public service is well-known by a lot of farmers right across Australia. Stand your ground and fightback and they will stop at nothing to destroy you. And that is especially true if you are running a financially viable operation and can’t be easily discredited. They fear nothing more than people with good business, environmental, and animal welfare credentials who will stand up against them. Don’t worry they have infected the Liberal party well and truly, and as for the Nationals their motto is don’t rock the boat. 10,000 head of cattle on a feedlot? WOW, what a money machine, with a pig farm next door it sounds to good to be true, all that methane going to waste, should be enough energy to produce a couple of megawatts of electricity a minute which politically should get instant response. CHANGE THE MUSIC SHEET ! Feedlot out… Biological energy producer in !!! Thanks for the response. I have looked at the approvals again, and it says that your 2002 works approval was to permit the construction of 14490 head feedlot. OK. But it also clearly states that the approved throughput would not be greater than 5000 initially, with further increases subject to performance. The licences that followed allowed 2000, then 6000 for a few years, then 8000 to 6000 head. So given the basis for your argument is that the DEC changed the rules, it appears that is not the case at all. Nowhere does it appear that you had approval to have 10,000 head. So, given you knew from the date the works approval was given that you could not operate at 10,000 or 15,000 head, why did you go ahead and spend funds developing the feedlot? I think it’s a bit unfair to blame the DEC for your failure to read your approval. If I am missing something, i would be happy to stand corrected. Oh I see how it goes now. Disregard laws rules and regulations, but just don’t piss off any influential advocacy groups and you should be fine. The old Chicago mob would be proud. This totally describes the modern environmental activists in their self acknowledge aim to “save the planet”. Even the ex PM described it as a moral crusade. This allows the followers of this quasi-religion to inflict any sort of grief upon the average citizen for “their own good”. How can we rid ourselves of these people. They seem to infest all aspects of our government so a simple change of governing party will not suffice. I certainly hope their are some creative souls among us who know the answer to this question. If there is not, then we are truely doomed to slow destruction. I have a lot of trouble comprehending this. Putting aside that we all agree that there’s nothing wrong with greenhouse gas emissions (hecklers notwithstanding), all those cattle were going to be emitting that day anyway, no matter whether they were scattered across the country or all in one place at the Thompson’s. Presumably this “top guy” attends AFL matches in Perth and protests about all the gasses being emitted at that event. What about the nation’s largest fun run, the City to Surf in Sydney? Around 50,000 people all emitting 50% more CO2 than they would otherwise that day. Two things are very annoying: the utterly simplistic notion that GHG is evil – therefore you are bad mentality and CO2 is pollution. The only times I’ve ever known CO2 to be an actual problem are with the aborted Apollo 13 mission and the crater lake episode in Africa (1980s) causing death by suffocation, a natural event. I agree with Eddy’s comment in another thread that if a catastrophe was going to occur it would already have happened by now. In his book “The Real Global Warming Disaster” Christopher Booker relates Dr Richard Lindzen’s observation that if the model’s assumptions relied upon by the IPCC were correct then the temperature in the 20th Century should have risen by 3 degrees instead of 0.6. The way they are all carrying on is crazy, like in terms of CO2 concentration there’s going to be a straw which broke the camel’s back. Maybe it will be me who exhales that fateful breath of CO2 during a training run in 2012! Human animals in america. We use high rise confinement pens called appartment buildings. We have area of population density that is much higher than in a feed lot. Our buildings are poorly ventilated and many do not get sunshine. The smell is covered by fragrances. We even have diseases spread like swine flu. Much of these attacks is from envy. Neighbors envy successfull farmers nearby. City folks who can’t be stewards of the outdoors are jealous. Elaine @125, you ask valid and reasonable questions. Thank you for the opportunity to respond. This is one of the many problems with the entire process. We got permission to build. We had to construct, then get permission to operate. Theoretically, at every stage of development, this was to happen. Of course, Western Australia would not be the thriving place it was if they gave someone permission to build something, but withheld permission to operate. The mere fact that the piggery already existed, the complainants appealed and were overruled, and we were on hold over a year ensuring that everything was in order, gave us extra reassurance that both locally and in the state, intensive animal agriculture was approved and encouraged. The 2005 licence was actually for 10,000 head, but the DEC failed to change the throughput number on the document when they issued the licence (they copied the exact 2004 licence). Such oversights are common in a bureaucracy, and when we rang to bring it to their attention, we were told we had permission to go to 10,000 head, so we did. The paperwork was never changed. We DID have approval. By issuing the licence each time, DEC was approving our past performance, and giving us permission to carry on. The bureaucracy naturally makes things so complicated that to fully explain our entire story and the details of something like what you’ve asked (should be simple, shouldn’t it?) takes so much time, and we have to explain it to so many people so many times, the average person gives up. Depression and suicide often result. We producers are presumed to be guilty until proven innocent. Innocence can never be proven in our case, because we cannot prove a negative. (Prove that unicorns do not exist. Prove that your neighbour never smells an unreasonable odour.) In a just society based on the rule of law, the burden of proof is on the shoulders of the accuser. If our regulator stops us operating, they should have to prove wrongdoing. They should have to bear the burden to prove that we did not comply, or that we intentionally committed environmental harm. That simply was never done in our case. The goal posts have moved, the rules of the game have changed, and we have not been afforded due process. Yes, Elaine, as I’ve said on another site, we have an “idiot” list a mile long. We are total and complete idiots. Who would have thought that we had a reasonable expectation to operate a facility that was highly researched, well planned, fully approved, and throughout its existence, supported by the vast majority of local people? We should never have invested our lives’ savings. We should never have put 8.5 of the best years of our lives into building…growing…improving efficiency and therefore the environment. We should never have hired young people without any experience, or older people with disabilities, or black fellas without confidence, or women who wanted to work outside, or good men who had never been given a chance to lead before. Shame on us for being so honest that we naively took people at face value. We should have known that evil lurked beneath the façade of good environmental regulation and that a very vocal minority would rule in a supposed democracy. In what kind of society do we live when victims are blamed for the crime? An excellent reminder to all of us — Lewis had it exactly right. I’ve referred to the same phenomenon as the despotism of benevolence. They will save you until they’ve completely destroyed you. The argument put by Joanne at the beginning of this piece includes the statement “By 2007 things were running well and they were approved to hold up to 10,000 head, and wanted to expand to the designed capacity.” I have simply looked at the public documents, and cannot see any licence that ever granted the Thompsons 10,000 head of cattle. That is, the claim that DEC approved them to operate at 10,000 head, as this site suggests, does not appear to be correct. In other words, if individual owners are not responsible, then Government cannot hold anyone responsible. Funny…they have to give us private property rights before they can take them away from us. Thanks for the clarification – if it is the case that DEC kept putting the wrong stockholding in successive licences from 2005, then (with the benefit of hindsight) it may have been prudent to get this corrected. Anyway, hope it all works out for you now that you have been given 10,000 head in the recent appeal. I’m not laughing. Your involvement in local government is commendable. Up to this point we all have examples of the problem and it’s certainly no different where you live than where I live. So now what? Perhaps I should challenge you to be a force for change and stand up against the money interests. Challenge your fellow council members to do the same. The problem continues because no one is willing to say, “The buck stops here” The quote by the way, is from a little placard President Harry Truman had on his desk in the White House. And there’s another quote worth remembering, this one on a placard on President Reagan’s desk. “There is no limit to what you can accomplish if you don’t mind who gets the credit.” I mention this because government and government service seems to attract large numbers of those who want the credit for doing something to, oops, for people. It’s hardly service they’re doing, but when it greases someone’s favorite cause it always gets overlooked. I think we deserve better. And if people can start to get themselves out of their own way we can begin to deal much better with some of these problems. It all begins with our choice of who to send to elected office and continues with our staying on top of what those elected officials are doing. And Matt, I don’t intend this to be a slap at you, not in the slightest. I don’t know where you live or how you vote on matters that you have to deal with. So my observations are from what I’ve seen over the years (more that 70) and not personal. We don’t need Atlas Shrugged the Movie. We are living it. Here is one particularly relevant paragraph from Atlas Shrugged, © Copyright, 1957, by Ayn Rand. It is to be found within Francisco’s Money Speech. From the United Nations it’s more like offensive (substitute what you think I would really like to say instead of “offensive”, I have no good use for the UN). As you know, being from the states, the right to own and control real property is one of the cornerstones of our republic. And I think it’s the same in Australia. Enter the UN with its agenda of saving the world from itself (read ruling the world) and then you get the nonsense we all have pointed out. And they aren’t the only ones either. When I hear stories like yours and the one I pointed out I feel personally assaulted — there but for the grace of God, go I. It’s an attack on all of us. Anyone can get caught up in this kind of thing. The views I express on this site could get me on someone’s hit list quite literally. I hope it can work out for you. Just please don’t give up. I don’t really think you will and a lot of public attention to your mistreatment is a good way to get things set right again. The cold hard light of day is a very good disinfectant. Bryan: Good evening, Senator Bob Brown. John:	And a good evening to you, Bryan. Bryan:	Interesting times for the Greens, Senator? John:	Interesting times indeed, Bryan. Play our cards right and we’ll control the Senate by Christmas. Bryan: Quite a step up for a junior party. Would you propose to use those powers to their fullest extent? John:	That’s the general idea Bryan. Bryan:	So in effect you would have executive authority. Even though you don’t enjoy a popular mandate? John:	Pretty popular with us, Bryan. Bryan:	Very true. But where’s your platform? Do you have a cohesive body of policies? Bryan: Can you tell the public what’s in this document, Senator? John: I can assure you, Bryan, that this document contains 100% recycled, unbleached paper. With carbon offsets thanks to a new growth tropical rain forest whose precise location escapes me at this present moment in time. Bryan: Don’t you know your own policy document? John: Now you mention it Bryan, I do. The said tropical rain forest is located in northern China. Nestled at the foot of the Himalayas so as to neutralise any localised man-made emissions and thereby be the salvation of the Himalayan glaciers. Brilliant, eh? Bryan: [Frustrated] But what’s IN the document Senator? John:	Policies, of course, Bryan. It’s a policy document. John:	Lots of things I suppose Bryan. Why don’t we have a goosey gander? John:	[Opens folder.] Well, for starters, there’s our environmental policy Bryan. Bryan:	Care to summarise it for us Senator? John:	No. Our environmental policy is No. No to mining, no to farming, no to forestry, no to industry, no to transport. And no harm to the environment. Bryan:	And no population, I suppose. John:	Like the way you’re thinking Bryan. But not for a year or so. Bryan:	And the refugees? The boat people? John: No mining, no farming, no forestry, no industry, no transport. Give ‘em two weeks and they’ll be asking for their boats back. Bryan: What is your energy policy? Bryan:	What about the mining tax? Bryan: What would you say to your critics when they suggest your policies will simply result in the collapse of the economy and in wholesale unemployment? John: Hardly the case Bryan. Our vision for the future offers a wealth of employment opportunities for all Australians in a green, sustainable economy. John: Chimney sweeps, rat catchers, tread mill operators, cemetery attendants. A wealth of employment opportunities Bryan. John: I beg to differ, Bryan. Our policies are specifically targeting health as a central focus in our platform. John: We are targeting obesity as a critical issue in our national health plan strategy. Thanks to our economic policy, for instance, the Australians will enjoy a leaner, lower calorie, lower protein diet. Bryan:	Doesn’t sound very convincing. John: And our transport policies will encourage Australians to engage in more exercise. Plus being a shot in the arm to the footwear industry. As I said Bryan – a seamless collection of policies across the breadth and depth of government. Bryan:	Realistically however, the Greens can only hope to be partners in legislation. How would you cope with forming alignment with another party? John: I suspect that you mean compromise Bryan. Compromise is an essential part of the political landscape, and Greens are not averse to meaningful discussion with other parties. Bryan: OK then. Whaling. What is your attitude to whaling? Bryan: What?! Isn’t that against your principles? John: Subject to terms and conditions* of course. Such as a strict “catch and release” policy. And a license fee, naturally. Bryan: Which would be a great boon to the economy, of course. John:	A welcome fillup to the books, I agree. But by no means an essential part of our economic strategy. Bryan: How else do you expect to pay for all this, Senator? Bryan: And where do you expect the money to come from? John: From the mint Bryan. Same as always. John: Through productivity gains, of course, Bryan. Under a green government, we would have the printing presses working 24/7. Bryan: But won’t that simply devalue the currency? Make a dollar nothing more than a token of its former worth? John: We’ve already factored this into our planning Bryan. One of our first initiatives will be the thousand dollar coin, followed shortly by the billion dollar note. Bryan: The Zimbabwe solution then? John: Exactly Brian! We’ll all be millionaires. And they said sound economic management wouldn’t happen under the greens! Bryan: A fascinating concept Senator. And the name of your policy document is? Bryan: How about “Change without Progress”? John: Change without Progress. Hmmm… Change without Progress…. I like that Bryan. Don’t have a pencil, do you? My experience is that the elected representatives are usually no where near as well educated nor clever as the bureaucrats who make these decisions, and they will usually prevail over the poor politician, even in blatant cases such as this. We need Liberal politicians who will support good businesses such as this or Labor politicians who will support the creation of good jobs for the people who elected them. We need them to ensure scandals such as these don’t happen, but I doubt that we will find any. The end result is we pay more for our meat and our banks lose money which they will easily recover by just raising their loan interest rates to all of us. Something positive: extreme environmentalism is not aimed only against “property rights”- it is aimed against the needs and aspirations of the human race generally, and so must be fought on many levels. The leading NGO for this task is the National Civic Council, of “Newsweekly” fame. It specialises in “grass roots” empowerment and education for social, industry and political reform, as well as leading the fight against extreme environmentalism from a Christian-humanist perspective. It is “guerrilla fighters for democracy”. It was built by men whose unions had been taken over by USSR-directed communist thugs by 1948. After a grest deal of sacrifice and danger, many unions were returned to democratic hands. The remnants, descendants and recruits of those heroes similarly volunteer for the common good in the NCC today. Unless good people learn to trust in eachother for effective mutual support and Australia’s real needs, we shall remain divided, disorganised, and vulnerable to both our opponents and to “sympathetic” opportunists who would like to exploit genuine grievances for unhealthy purposes. I thought this was about the environment. That sounds like you think it is about speech control. Ah – here is the problem – the public servants themselves are the global warming elite (according to them) and have convinced themselves that the fantasy of AGW is real. It’s always been a battle between the intellectuals and the empiricists, ever since the times of Plato. Of all the tryannies, a tryanny exercised for the good of it’s victims may be the most oppressive. It may be better to live under robber barons than under omnipotent moral busybodies. The robber barons cruelty may at some point be satiated; but those who torment us for our own good will torment us without end, for they do so with the approval of their own consience. It’s such a good quote I’ve pasted it in again just for good measure. However, what C S Lewis failed to notice is that corruption ultimately always dismembers those “omnipotent moral busybodies” and has done in every empire throughout history. The churches sold indulgences, the black market offered Western luxuries to Soviet workers and people in key bureaucratic positions are happy to take protection money to make sure business runs smoothly. It works much the same in every country. The best essay explaining this process is the “Baptists and the Bootleggers” where the Baptists espouse the prohibition of alcohol and the bootleggers make sure the market gets what it wants (at a price) then donate handsomely to the Baptist church to ensure a continuation of the prohibition that delivers such excellent profits. This is why money has no morality. It is completely amoral and will serve the thief, the robber, the swindler and the gambler just as faithfully as it will server the businessman and the hard worker. The money is merely a medium for getting things done, if we set up the power structure in our society such that the only way to get things done is via corruption, then no surprise that is the way the money will flow. Of course, operating a system through corruption is less efficient than operating it through good governance… but it does serve as a limit to government power, which is very useful when no other limit exists. You are continuing your “caring role” for people that count as do the people here that visit your site…You should be proud and I commend you for your insight and your “Spiritualness” towards the good of Men and Women! Did you know in Australia it’s possible to ruin a business if you don’t like the way it smells? I have posted a link to this page to highlight the plight of Matt & Janet Thompson on the Queensland Country Life page regarding future feedlot development on the Fitzroy River. I doubt it will get past their moderator though….lets hope. This is the link I posted comment on. I am grossly ashamed (but not surprised) that you have been treated so terribly by bureaucracy gone mad. Blessings to you, Matt and Janet. May some miracle save you and your business and my the strength be with you, always. Well my Austrailian friends,you got off to a good start when Rudd got dumped, now you need to dump his party from the government get some folks in there that have a grip on reality. Ministers who would fire arbitrary bureaucrats are needed badly. The airheads that use environmentals laws to further their no growth agenda need to rooted out like dandelions and banished from positions where they influence the lives of others. As someone who is actually planning on voting for the Greens (*gasp*) this whole situation is disappointing. I definitely agree with a number of the comments on this thread, but I think it is a shame that environmentalism as ideology is being blamed. Clearly the EDO didn’t have their priorities right, and the underhanded and unfair treatment of the Thompsons is disgusting. But to claim that somehow this can then be attributed to an entire political ideology I think is too far. Sure, fight against government bureaucracy, but don’t turn on the green movement. The policies relied upon by the minority of complainants and the EDO were introduced for sound environmental reasons, however in this case they were clearly misused. The conflation of these two issues is demonstrated by the different directions people have taken on this thread – some are using this story to propound their own views on climate change, some are discussing government vindictiveness and some are discussing the specifics of the approval. I would like to see a separation of these issues – of course not in this thread – but in the argument that has pervaded this story: ‘the EDO did something bad, therefore everything to do with environmental defence is bad’. It’s a logical fallacy in my eyes. @Kurt W: If more people knew about the environmental and human rights crisis happening the bush, I would hope that you would think twice before voting Green. Green preferences have held Labor State Governments in power during which restrictive vegetation control legislation has been implemented, often brutally. The Greens like to support International human rights, and that is a worthy goal, but to ignore the human rights of farmers and their families is just plain wrong and needs to be addressed. The Vegetation Control Legislation is hurting the environment too. I am a city dweller, on a steep learning curve. Learning about how not clearing the undergrowth can result in dimunition of grass and resultant soil erosion. Learning about how these restrictions result in land management practices that are not in keeping with sound land management. Learning about how locking farmers off their land actually kills our native wildife (because the farmers are not there to control the feral pigs, goats, rabbits, etc). I am also learning about the abuse of power by the State and of the unlimited power of the state. A recent enquiry has it all. You can look at the submissions if you like, but it would be better to find a mate in the bush and reconnect with the land. I appreciate you posting here. Never stop asking questions. @Thumbnail: Interesting video. Would you be able to post a link to the the Senate Enquiry please? I am having trouble finding any information on it and I genuinely am interested. I would also like to know where the phrase “Wilderness proposals can incorporate any area of land, irrespective of tenure” came from, as it is not from the Wilderness Act 1987 (I just checked). Besides that, thank you for the link. And please do post those others if you can. I can answer that for you. I had my property nominated for a Wilderness Assessment, without my knowledge or consent. There were a total of 29 landowners who had this same legislation on their properties as well at the same time. We all had different tenure of land. It has been a number of years since i read that legislation – trying to forget it and the impacts onfamilies. I can assure you that the Wilderness act of 1987 does NOT discriminate on any tenure of land. @CateS: Thank you for clarifying that. I am in no doubt you are correct about the facts of the issue (given your personal experience), I was just wondering where that specific phrase within the video was grabbed from. @Thumbnail: I found the Senate Enquiry as well, you had posted it previously. My fault. Is there an update to the Thompsons predicament? It appears that besides you and Andrew Bolt that other media outlets are becoming a tad reluctant to run their story…could it be because the Thompsons debacle is now becoming politically hot? Could there be as suspected a closing of ranks from the other “stakeholders” due to a “cover up” being implemented? Silence from these parties is not doing them any favors i would suggest! In fact i would go as far as to suggest it is strengthening the Thomspons case! As i look around other blog sites for example a little one called http://www.ourpatch.com.au the Thompsons story has even made it there. People want to know what the outcome of this injustice is…why are MP’s doing the old “run, duck and weave”? This injustice is far from over i would suggest, and there will be many including the NFF that will end up with egg on their faces if they do not take a stand on this situation. Another thing, why have not the DEC or EDO issued a press release – or have they? Where are the complainants who initiated this debacle – they need to step up and justify themselves to the ever increasing support base for the Thompsons. Ah, so many questions, so little answers – what do you think Jo? SBS has taken more interest than ever in this story and many others, due to the Greens deal with Labor. We have all seen that the Greens preferences have been used to keep State Governments in power. We now know thanks to the recent Enquiry into Native Vegetation etc that many farmers have had their property rights and their basic dignity abused by both extremists and by maladministration, using the Preference deals to continue the ongoing human rights crisis in the bush. If Labor and the Greens form an unholy alliance there will be more years of hurt ahead for farmers. If the Greens are so committed to international human rights, why don’t they have a policy on domestic human rights – the rights of farmers who have been stripped of their assets. The only way to get the message out is to reach across this great big country, across borders, time zones and regions. This is a massive problem for Australia’s image and must be rectified. Read the Hansards. Every word. There are stories of abuse, chicanery, vindictiveness, violation and utter bastardry. Page 25: Senator POLLEY—I think it is fairly clear from the evidence we have had before us that there is what I would, in good grace, call an unforeseen impact of this legislation. … It is pretty obvious to me. My family are not in farming now, but generations of us have been. I think I was one of the wise ones, or my father was, to move away from the land because of what was happening. This is good news if SBS has taken up some interest as well – we will see if they can be objective and fair in this red hot issue. Those quotes from the hansard are bloody disgraceful! I will read with interest what else is in there. The Senators must also be accountable for what they say, especially at an inquiry on this issue. As regards your question, yees there are many unanswered questions. There was an appeal determination in June, so it makes all the blogs a bit superficial. Yes long time no contact, hope things are good down south. Norm, dont you live near a abbies? or was it a saleyard? Yes, i have read this document (among many many others) this thread is still very very relevant Norm, and in fact i am ever so pleased that you put this link to that document on here, on Jo’s site. The link once again, proves the inconsistencies with the Thompsons dilema. How can anyone, anywhere, continually afford to comply with liciences when as soon as they meet the terms and conditions, the goal posts are moved again. The “spin doctoring” that has gone into this document is to be commended! never have i read anything so totally removed, and cherry picked, to make an individual business look like the villan! Outrageous – but, you and i know Norm, that this is how organizations such as DEC/EDO’s protect their self serving interests. I have walked around the retention pond, in fat i scrutinized it! I very carefully inspected every aspect of the Thompsons infrastructure. The Thompsons are being set up by DEC to not be able to be a viable business, by the very nature of their actions – they (DEC/EDO) have achieved this. One thing i do whole heatedly agree with is that their is an odour problem – but is certainly is not the feedlot in Narrogin! You are disappointed that environmentalism as an ideology is being blamed and you are planning on voting Green. The only reason that environmentalism is being blamed is because the heartbreak and economic destruction caused by green laws is endemic through all states. The case of Matt and Janet is the one that is in the media at the moment but there are many more out there including many that cannot be discussed in the media as they are still before the courts. Peter Spencer brought the issue of property rights to the mainstream and as more light is thrown on the subject we will womder how a sophistocated democracy like Australia ever let an environmental ideology so thoroughly infiltrate all our systems and violate our human rights. Farmers and farm businesses are being picked off one by one. As some-one who bumps up against this issue every day I can only warn that a vote for the Greens is a vote for offshore farming. I, too have read the transcripts of the recent enquiry into Native Vegetation Laws, Greenhouse Gas Abatement and Climate Change Measures. I have personally met some of the recipients of the Green-fuelled ideology and subsequent legislation. I would go further: A vote for Greens is a vote for domestic human rights abuses – to some of our most isolated and vulnerable citizens. A vote for the Greens is a vote for increased rural suicide, families destroyed and another community affected. A vote for the Greens is a vote for corruption, and of the abusive and unlimited power of the State. And lastly, a vote for the Greens is a vote for destruction of native biodiversity. Mr Underwood—Farmers can deal with seasonal variations in climate—rain, drought et cetera—and they can deal with market fluctuations. You can budget for all those. You can put counter measures in. What you cannot budget for in monetary terms or in time frame terms is environmental agency or planning interference, because there is no time frame on it. You have no idea how long it is going to cost you; you do not know whether you are in a legislative risk or whether you will escape prosecution. That is a major concern. “There was an appeal determination in June, so it makes all the blogs a bit superficial.” – Assuming you mean that Matt & Janet have abounded an “over-simplified” argument which is subject to an erroneous belief of some sort and, lending comments to be made around that belief. In a nutshell old squid, what a lot of crap !! There is nothing “superficial” about any level of admiration for the reprehensible. Thanks, but I have read that appeal determination document. It says they can have 10,000 but attached impossible conditions like – they can only stock 6k until they prove they can manage 10k. It is still conditional on the DEC “approving” 10k, there are also new conditions that weren’t there. It’s onerous, and no bank would loan them the money knowing that DEC can change their operating conditions ad lib. Actually, the Thompsons have already had some of the longest most in depth odour testing done in order to show they have reduced odours. Yet the doc asks them to do exactly that which they have already done. What more can they do? Remember DEC had 11 months warming to give them an expansion on their previous 10k licence. DEC took 15 months and then cut their operating license almost in half, but all the contracts with businesses were signed for managing 10k (so the Thompsons went broke waiting for their appeal to go through), the appeal took 15 months or so, and when DEC responded saying 10k was ok, they loaded more conditions on, and only left 6 months to go before it expired – so no bank would loan the Thompsons money on that. They were forced to destock. 6k stock won’t bring enough money in to cover the bills for a farm designed for 15k. It’s like asking a Coles outlet to only fill 1/3 of it’s shelves, yet pay for the floor space, the car-park, the rates and the rent for a larger store. The DEC did the worst possible thing for any business, effectively setting up the Thompsons with false expectations, then suddenly withholding the one thing they needed to meet all the agreements the Thompsons had had to sign. Business need to know the rules BEFORE they sign deals for equipment and supplies worth millions of dollars. IF DEC changes the rules they need to compensate the businesses who that affects, and give adequate warning. This is whimsical kingmaking. Foreign investors in WA should know that DEC has the right of veto over any project at any time, and if investors come here they need to butter up the right people, hold their tongues on topics that are not DEC-fashionable, they must bow and grovel to the poseur-royales of the WA government who can ruin any business – even those who have broken not a single law. In other words, treat WA as a sovereign risk equivalent to third world countries. Spread the word, as long as DEC runs WA, keep your money safe and invest it elsewhere. Well said. I fear that the whole of Australia could be seen as a sovereign risk equivalent to third world countries, due to the abuse that is going on in NSW and QLD with the locking up of land, and green revenge should any farmer speak out. No more, I say. Surely true environmentalists who care for our country would be appalled at the way these farmers are treated by the abusive and corrupt State governments kept in power by those Green preferences. You are talking my talk – NO MORE I SAY – the election and beyond is a fight worth taking on – no holds barred – all politicians need the battle thrown up in their faces, Peter Spencer, Matt and Janet Thompson – my case – enough! Lets take it up to them – BRING IT ON! I’ve copped many thumpings. Peter Spencer is not the least. I feel now he’s still in with a chance. Surely you are not suggesting all appeals documents are forgories? Yjat’s enough to bring a government down if any proof can be demonstrated. Under the unusual system they have in WA I imagine all evidence is by affidavit. As to the objectors, that is typical of smal town politics. Churches, masonsand others continually shift ground. As I said eariier, I place great store in your visit to the site. Yes it appears that Peter Spencer is in with a chance, in my opinion most people associated with Property Rights in Australia will be watching and waiting with baited breath. As for your second sentence Norm, “Surely you are not suggesting all appeals documents are forgories?” are you directing this comment at me, or “hide the decline” ? I stated “The “spin doctoring” that has gone into this document is to be commended! never have i read anything so totally removed, and cherry picked, to make an individual business look like the villan! Outrageous – but, you and i know Norm, that this is how organizations such as DEC/EDO’s protect their self serving interests.” i still stand by that statement. As you would know Norm, these documents are carefully crafted – wording is everything when it comes to legalities – therefore it is not in the best interests of the minority group of initial complainants, EDO / DEC to admit liability or have their intentions questioned. 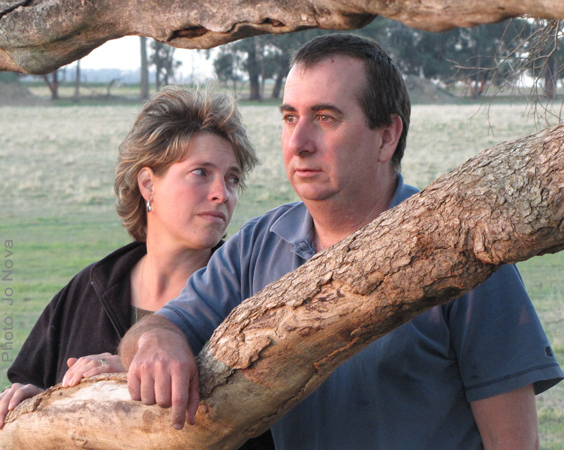 Rather, to state that the Thompsons did not meet the requirements, it is however, in the interests of the aforementioned parties to have the document that you have posted, stating that the Narrogin Feedlot was at fault – when clearly with other licencing conditions all criteria was met – the conditions were continually changed at the Thompsons complied. “Under the unusual system they have in WA I imagine all evidence is by affidavit.” Could a WA resident, or someone who knows the legal system in WA please clarify this point – i do think it is important. I would like to see if possible an affidavit from the complainants. I agree Norm, it usually is a minority of people who have too much time on their hands who like to have a whinge about insignificant things – however, i stress that what is important to “me”, may not be important to “you” – generically speaking. I like productivity, employment, it contributes to the local community,the result being that the community benefits – in the Thompsons case, the community certainly did benefit. Thank you for your compliment re placing great store in my visit to the site. We need to push forward with the Thompsons, as they are gaining ground. Political ears are “twitching”..as so they should! “Surely you are not suggesting all appeals documents are forgories?” – Inquiring into a document’s objectivity does not, by any definition, amount to a claim of “Forgery” and, as you only posted a single link to a single document it’s definitely extraterrestrial for you include that “all appeals documents” (emphasise – “All”) have been under enquiry. I’m reliably informed that dog-whistling is an art form so the question arises; with your personal preconceived findings have you dog-whistled up anything other than a mongrel that is embarrassingly burdened with flatulence ?? Yes the EPA is attempting to put stringent regulations in place to limit the amount of dust allowed on a farm. If the EPA didn’t have a useful purpose, they’d need to invent something to keep themselves occupied. The irrelevance of the EPA is very much like the UN’s. Both in cause and effect. Once the initial great goals were substantially achieved, they lost direction, focus and effectiveness at solving real problems. The institutions grew to justify their existence. So they need to invent and solve fictitious problems; which by definition, are easily fixed by dissolving the institutions. Tel and Bernd, your observations are correct (I think). The EPA is now fully at the control of the green left and perhaps even worse at the control of forces contrary to democracy. Their useful purpose is not readily visible unless you have red glasses on. First they came for the beef producers. A wake-up call to those who would oppose tyranny: get control of government or it will get control of you. The Environmentalist jihad against animal husbandry in your charming country is not limited to the Thompsons. Here’s a link to a news story about the plight of a family-owned chicken farm in New South Wales. I think that a proactive solution to the ‘noise problem’ would have been stronger disclosure laws on residential real estate. Then the newly-arrived NIMBYs could still shed crocodile tears, but they would not get any political traction in their quest to screw a farming family, in order to improve residential property values. This is the type of “fundamentalist dogma expected from RELIGIOUS zealots” cut of my nose to spite my face.. The 2 party myth in Aussie proves the spell of the New World Order is alive and well with GLOBALISTS set to pillage wealth and then populate Aussie with 35 million illegal immigrants, Illegal in that the Sovereignty of Australia is meaningless to the Globalists, the shoe will be on the other foot when the Greeny’s wake up to no job, no welfare, no hope!. Phew, this is a nasty story, but it should be solvable. The DEC has a strict approach to odour and how it is assessed, it shouldn’t be too difficult to work out whether the odour from the Feedlot breaches their standards or not and if it does how it could be reduced. The requirement in the license to not unreasonably cause odour to others in an offsite location is actually a standard clause, which shouldn’t be too onerous in practice. Ultimately, there is always recourse to the State Administrative Tribunal if a case is particularly unfair. I have a pretty good working relationship with the DEC and would be happy to look this over to see if a solution can be found. I am an (experienced and qualified) air pollution consultant, but would be happy to chat without cost, if it would help – let me know. Seems to me those who issued the licences were not equipped to do so….any issues should have been resolved prior to licences being issued not after….its akin to Queensland Government selling water in the Balonne River that was never there to sell in the first place and then having to buy it back….total incompetance. Cate, Jo what really dissapoints me about this story is although government were aware of the issues and some WA politicians attempted to get results for The Thompsons…nothing was acheived…the fact that there is everything in place to protect someone who makes a complaint over someone who is complained about is unfair unjust and just plain wrong….especially since Matt & Janet consulted heavily with the community prior to development of the site without an objection from anyone in fact the community was in favour…so someone has claimed that Janet said there would be no odour and now this person feels betrayed….I am sorry but I do not believe for 1 second Janet would make such a statement…which obviously would be a claim to her own detriment and Janet is not a fool….she did not say it…this woman is not dealing with the truth…No one should be able to make a claim they cannot substantiate and it is not Janet who did….Matt & Janet would not be allowed too get away anything that resembled fiction and neither should a complainant…. Matt & Janet have been left to the wolves and it is wrong….government should have put something in place to sort this issue out….The DEC issuing them a licence they knew could not be complied with is not a soloution….they have fed them to the wolves…I still think government could intervene and find that soloution so everyone can be happy…even the NAB but it certainly looks like they do not have the intestinal fortitude to do so….debts can be restructured…lots can be done to correct a situation that should not have ever come to this…the one and only thing that truly cannot be reinstated is Lindley Bosely…..
A licence to produce anything at all from the DEC is worth nothing….no bank or lending authority will be able to structure a loan against any business that needs a licence from any government licencing authority to operate…licences will not be worth the paper they are printed on…anyone who has a licence now… it is not worth anything…imagine what this will mean to the Mining Industry let alone our Rural Industries and any business that requires a licence to operate. It is time to step up for all of us…not just for Matt & Janet but for all of us including Lindley Bosely. I so sympathise with this nightmare. Australia markets itself as a free, fair go country and we came here with hopes of providing our family with a better life but after 4 years we are ready to pack up and leave because of the ever decreasing rights being afforded to property owners. Despite the fact that the law is supposedly on our side it is not being upheld in the courts or tribunals we have a property that we own yet cannot do anything on without seeking permission from the local authority who have placed a builidng envelope on the property which we knew nothing about and which was not disclosed to us when we bought. As you say red tape is killing people and this country is more like a dictatorship. there is an obession with control and it seems commonsense no longer exists within govt depts. For us we know this in not the country to bring up our children and it has brought us to despair as all our efforts to mediate and resolve have been in vain as we can’t get answers from anywhere and help has been non existent. I pray that your family will survive as no one should be denied the right to set up business and try to make a better life for themselves as long as the activities are not of a criminal nature. Jacqui, thanks for your comments. Keep your chin up! We see this as a world-wide battle of centralised control versus individual freedom and responsibility. Good people…no matter where they are in the world…have got to stand up together and speak out on behalf of private property and basic inalienable (common law) rights. The Climate Change movement has been the granddaddy of all movements to take away individuals’ freedoms. To date, it’s the largest fraud ever perpetrated on the world. But the Hydra has many heads, and the UN and other pro-centralised-control freaks have many campaigns to advance their agenda. Planning, environment, transport and water are the main government departments marching. We should all be aware of more stories of how the monster is gobbling individuals and gaining power with each victim consumed. I’m sorry that you have had such a negative experience, and I truly do not hold your decisions against you. But I’m very sorry that Australia is losing you. I believe that we can make a difference… We HAVE to make a difference, or our children will not be free. Thanks for writing Jacqui. I wish I could help each and every family caught by this noxious red-tape. I simply don’t have the resources, but perhaps I can write a kit or a how too list. Information is our friend, and the best thing injured parties can do is document everything in a simple well organised system. It makes it so much easier for journalists and bloggers to get your story out to the world. There are free web hosting sites — simply loading up the documents, with all the links on one page would help. Cutting and pasting the single key sentences is very important. It’s the hardest thing, but if there are 20 reasons to support you, you need to be able to list them with numbers and a link as 20 single stand-alone sentences. But here’s the hard part, if only 3 of those points are solid and unattackable, then you only need three and posting all the others won’t necessarily help and may even work against you. Hypothetically, if a journalist or an MP is going to pin their reputation on spreading your story, they need to know exactly what is verified and where to find it. Jacqui, FIGHT! I too know what it is like to be on the receiving end, like Janet, and hundreds of others. I am currently working with 1,000 families – YES ONE THOUSAND!! They have been going through hell on earth – how ironic to write this on Christmas eve. Some have suicided, some have died while waiting for justice – some have been shot at, had people try to run them off bridges – all in the name of the environment, and all due to legislation and laws that are just senseless! You are not alone, dont ever, ever think that you are. People are fighting back – so fight with all your might, and never, ever give up hope. By helping others you are able to make a difference – have you ever thought of that? Its true – hell, just ask Janet, she can tell you that. Merry Christmas Jacqui, Jo and Janet – see, already the JJJ club,you have made a difference by posting here, thank you and God Bless. To The Thompson Family, I feel for you. It seems this is no longer a democratic country. We belong to a Fabian Society driven Government hell bent on selling us out to the Chinese by the borrowing of billions. It is absolutely disgusting that this can happen and that your lives are being destroyed. There are many people who are angry and the media seems to be silent on such issues. There is corruption but how can you do much when its government and their failure to take care of those who vote for them. Keep up the fight we want you to win.